A few months ago I was talking to my friend/sister Lindsay, and she was telling me about her exciting plans to move out to Hawaii indefinitely, and the big circus party she was going to throw as a sort of farewell party and birthday party for her and her 3-year old son. Part of me was so happy that Lindsay is going to live the dream and actually move back to Hawaii to raise her kids for the next few years, but part of me was so sad that they were moving so far away. After our Hawaii trip over the holidays we were reminded how much it takes to get there. So after a lot of back and forth, Marcos and I decided that it was a very worthy venture for Miss Gigi and me to head out to Utah on a surprise trip for a few days at the end of May, to soak up the Utah chapter of the Gibson/Fetzer/Helding family, and get in our family time before their big move. Plus, how could we miss the circus party? The surprise arrival was hilarious and I loved being put to work with the party planning. Carol and Dan were nice enough to let us stay at their place, making persons #12 and #13 staying at the house, plus two dogs. There was a lot of love in the home, and Gigi was in Heaven enjoying her cousins, the doggies, the trampoline and the yard. Apparently the outdoors felt very liberating in Utah, because this is how we found her running around in the backyard one day. When we were in Utah Lindsay celebrated her birthday, and while her husband Keli'i took her out for breakfast, Gigi and I had the chance to spend a few hours together on BYU campus, doing some errands and enjoying the peacefulness of BYU during the summer. We stopped by the candy counter at the BYU bookstore, of course, and Gigi chose chocolate covered raspberry sticks. We walked around campus and ate our treats. I had forgotten how nice people are at BYU. I work at the UNC School of Social Work, and a place like that attracts a great deal of very good people, but at BYU we had so much help from people opening doors for us as I was navigating the little one, and lots of hellos and smiles from perfect strangers. It was just a noticeably pleasant place to be. For Lindsay's birthday dinner the night before the big party, we had a special treat - dinner at Tucano's, a Brazilian churrascaria in Provo. Lindsay's oldest, Maika, kept asking her if he could go to that place where they come around with different meats and you have a thing with a green end and a red end to let the waiters know if you want more meat or not. It was a great night out, and we all ate enough for a few days, of course. And then came the Gibson Family Circus! All of the photos of the party were taken on another camera so I don't have access to them at the mo (another post in the future? ), but it was so much fun. I'll just summarize the party by saying: bounce house, clown noses, photo stand, hot dog stand and amazing potluck foods, caramel apples and cupcakes, a clown who did face painting and brought balloon animals, cotton candy machine, circus games, buckets of popcorn and boiled peanuts, a rainbow lollypop stand, and cracker jacks and animal circus cookies to take home at the end of the night. The kiddos ran and played while the adults enjoyed the tables in the middle of the room, eating, chatting and watching the mayhem. Gigi was in heaven: I told her that at the party she could have treats, and she took it to heart. I caught her throughout the evening with two cupcakes, two caramel apples, and at the end of the night when I thought we were finished, I caught her palming the last two chocolate chip cookies, one giant cookie in each hand. Luckily, with cupcakes she just licks off the frosting and the caramel apples she couldn't even begin to tackle, so I'm hoping her sugar intake wasn't as atrocious as it appeared. Our last night in Provo, after a really great Sunday at church (the last week for Lindsay and her family), we had an amazing meal prepared by Carol and Dan. I realized that I hadn't taken any photos just of the family being family, so I grabbed my camera to take some impromptu captures. The kids at the top, being kids, the amazing meal, Carol and Amanda, Lindsay and Maika, and then the rest of the clan. What a super, super visit with our beloved family friends who will be making Hawaii their home this summer! Thanks for always welcoming us in like family, and best of luck in a new place. Hawaii no ka oi! And then, to top off a great trip, we spent Memorial day up in Roy, Utah with Marcos' brother, sister in law Marie, their beautiful girls and Mamãe! 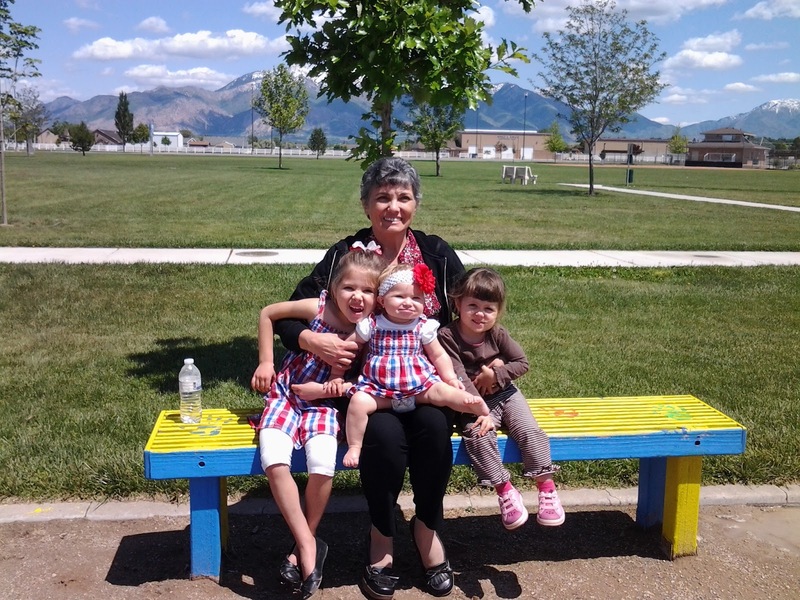 I had forgotten my camera in Provo, so we don't have many photos, but Marie got a couple on hers and I especially love this one of Mamãe and three of her four granddaughters (another granddaughter and grandson are on the way)! Gigi loved playing with the family, and especially coloring with her cousin Kaitlyn and her Vovó. 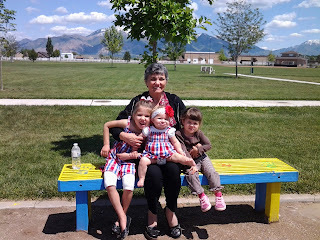 We were spoiled that day, with a family picnic at the park, and a Memorial Day bar-b-que with Marie's family. It was a perfect end to our trip, and we are so glad that we had a day to spend with family up in Roy. Spending time with family and friends is a highlight for us in life. The trip was fabulous - we got in all of the playing and bonding time that we wanted, and we were able to help out with the Circus party. However, I think I'll bring Marcos along next time. Gigi didn't sleep super well in our new places, and without Marcos there to tagteam, sometimes it was really exhausting trying to keep an eye on the girl in a new setting, and my patience kept running thin. On the flip side, we had two late night flights on the way there and back, and Gigi did surprisingly well during the commute. She just stayed up until she was ready to sleep, and then took her blanket and curled up on the floor beneath the seat in front of her. Nastiest place on the plane, second to the toilets, but if that's where she was going to sleep peacefully, I wasn't going to fight it. yes tell me then ill try to come down and see you guys. we don't go very much because of work and life, but we visit family and stuff. this weekend my oldest brother jons daughter jenny is getting married.